Any British can tell you that Liverpool is a city with not a very good reputation, that there is a high crime rate, that its residents are all drunkards and rowdies - aggressive and dull-witted. 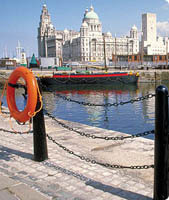 Several centuries ago, Liverpool was the largest port connecting Britain with America. Millions of immigrants went to the New World exactly from here. And some people, vice versa, came here and settled in the city - this way the first first world China Town appeared. The population grew and the city prospered, and Liverpool then was considered the second city after London. However, by mid-twentieth century the city started to make a dark impression: many firms and businesses came to ruin after the merchant ships began to use more modern ports. Now Liverpool is very clean and beautiful city. And by the way it was even chosen a cultural capital of Europe in 2008.